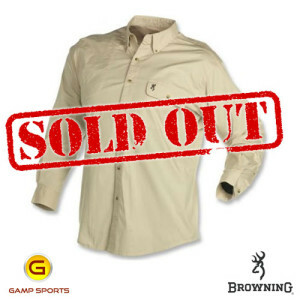 Categories: Hunting Shirts, Men's ShockEater Shirts, Men's Shooting Shirts, Shooting Shirts. 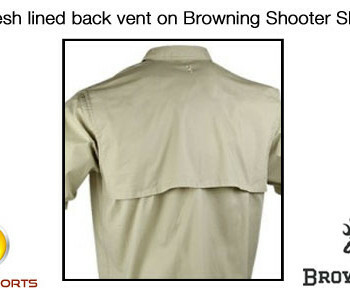 Tags: Men's Shooting Shirts, ShockEater, Shooting Shirts. 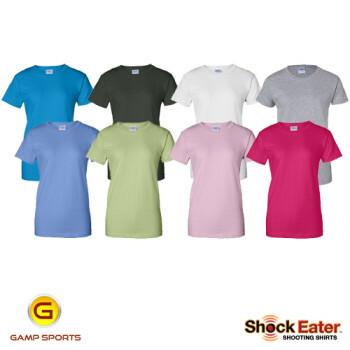 *Dark Heather, Heather Cardinal, Heather Indigo, Heather Navy, Heather Sapphire, Safety Green, S. Orange and Safety Pink are 50/50 cotton/polyester. 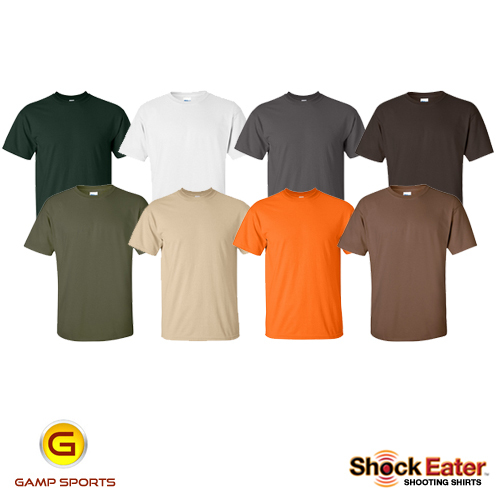 Antique Cherry Red, Antique Irish Green, Antique Royal and Sport Grey are 90/10 cotton/polyester. 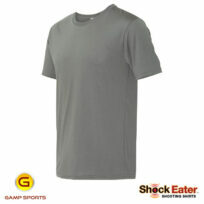 Ash Grey is 99/1 cotton/polyester. 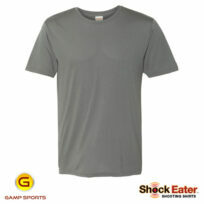 I have purchased 5 shirts in 3 different orders and find them to be of the highest quality material and workmen ship. The ShockEater really does the job for me. I have a custom made stock that is all wood from receiver to shoulder, so there is no recoil pad to take any of the energy from the shotgun. 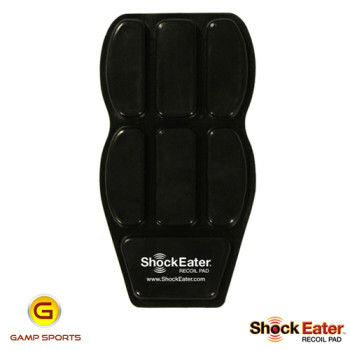 With that said, I can say without hesitation that the ShockEater pad really works, trust me on this one. Just returned from Bolivia dove hunt 3 days ago. Shot 90 boxes of shells in 2 1/2 days. Shot 25 boxes in one hunt just under 2 hours. I used the cotton T shirt and double stacked 2 pads. Not a single bruise on my shoulder.I have a disc issue in my neck. Neck didn’t hurt like it normally does after 4 boxes on sporting clays. These pads really work. Well worth the money. 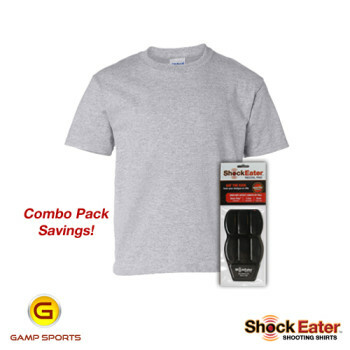 Solid quality shirt and the pad pocket is placed just right. The stitching is a little itchy at first, but after a few washes, it’s no longer an issue. 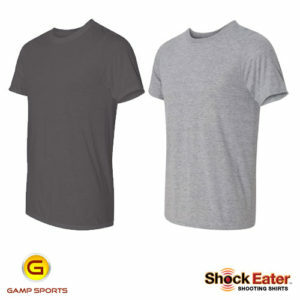 This is my second review and it’s about the shirt and pad I ordered for my son. 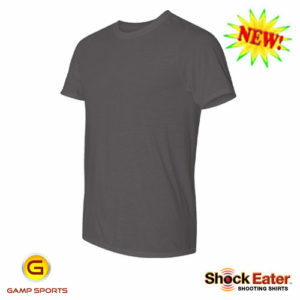 Yesterday, my son, who is 9 years old, and I went trap shooting and this time with the Shockeater pad and t-shirt…. Let’s just say my son had a blast !!!! He shot over 100 rounds of trap and had ZERO complaints of shoulder pain or fatigue!!! Before I got him the Shockeater pad, he’d only shoot maybe 10 or 15 rounds from a 20ga. semi-auto and had shoulder pain. Yesterday he started out with the semi-auto, shooting a box or so and stepped up to my O/U 20ga… now he wants my gun because he was busting some serious clay birds and loving it ! Believe it or not, this pad actually helps both of us for proper mount… !!!! Well, I could go on and on about how great this pad is, but I’d suggest getting one and see for yourself how nice these work. We won’t shoot without them…. p.s. 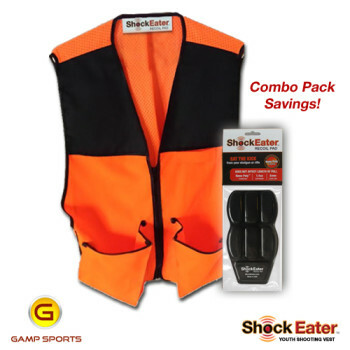 … We also use our pads for riffle shooting and it’s AWESOME…. now my kid want’s to only shoot the bigger cal. riffles… the .22 cal just ain’t cutting it for him no more !! Thanks Gamp Sports for the GREAT PAD !!!! 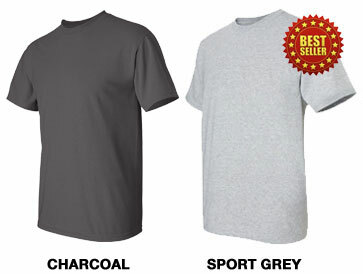 Recently purchase one of your shirts. Seems to work well with no problems in fit or function. Have a suggestion though. I shoot both left and right. How about making a version that has pockets for both shoulders? 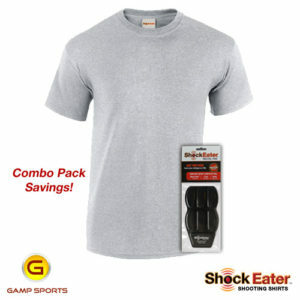 Nice T Shirt and Shock Eater pad installs easily. 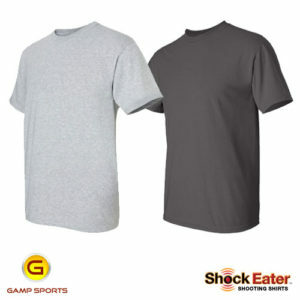 Like all shirts these days the sizes are trending larger and larger. I wore XL T Shirts for years and now I’m down to Mediums. 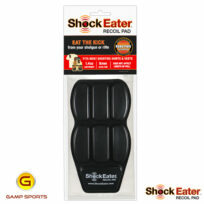 I highly recommend ShockEater products!